There is zero tolerance for spotted wing drosophila (SWD) infestation in fresh marketed fruit, meaning that detection of a single larvae could result in purchaser rejection. The lack of tolerance for infestation means that the risk of crop loss is high. Research from the University of California, Davis has estimated potential losses due to SWD in CA, OR, and WA to be over $420 million dollars annually for those three states alone. Estimates of crop loss in the eastern US equaled an additional $207 million dollars of damage for reporting states. 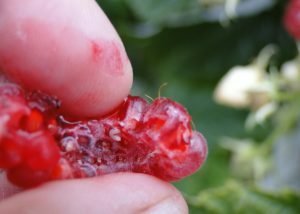 A single SWD larva, such as the one found in this raspberry, can cause the rejection of an entire shipment of fruit.